The Mediterranean diet can prevent cancer and, through the action of a host of bioactive natural compounds like Apigenin, and its low sugar content, it can kill cancer cells and correct cancer. The Mediterranean Diet is associated with a reduced risk of cancer and cardiovascular disease, according to a number of studies. The Biochemistry linking the diet to greater health puts the accent on omega 3 oils, high amounts of natural fibre, antioxidants and polyphenols found in vegetables, fruit and olive oil. Plus the use of good fats (and fat in general) in preference to carbohydrates (and certainly refined carbohydrates). Extra Virgin Olive oil is an essential ingredient. The Mediterranean Diet is the epitome of a cancer prevention diet, but it seems it can also correct cancer. For example, Ohio State Research showed the Mediterranean Diet contained high levels of Apigenin, which makes cancer cells mortal. In 2017, research showed that women who adhered most closely to the colourful Mediterranean diet were 40 per cent less likely to develop breast cancer. 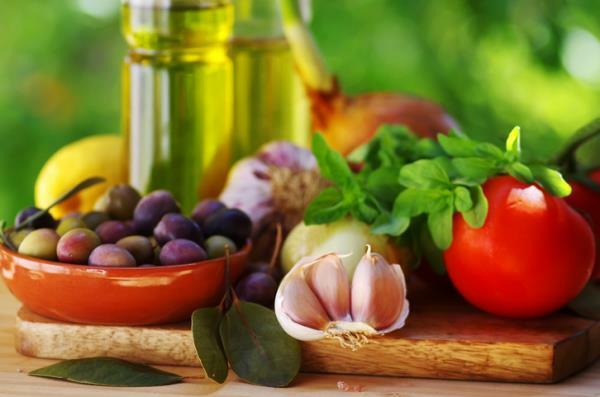 Previous studies have linked the Mediterranean Diet with less prostate and colorectal cancer. Studies have shown how important healthy fats are. Eating even more olive oil and even more walnuts actually protected people from cancer even more than simply sticking to a Mediterranean Diet! Even wine (modest amounts - one to two glasses per day) has been found to be protective.